Shirley G. Carter, a member of the Washington, DC – Baltimore (WDCB) Chapter, was the first African-American female elected to the STC Board of Directors. She was an STC member since 1976. 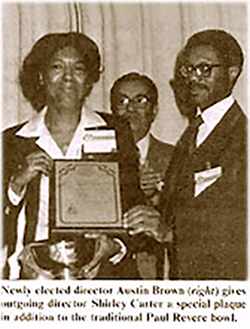 After serving as Region 3 Director-Sponsor from 1979 to 1982, Ms. Carter was an Assistant to the President for Member Programs until 1984. 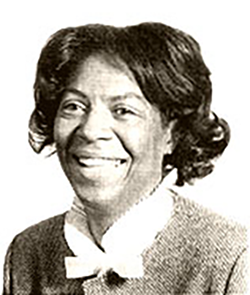 Ms. Carter was instrumental in the Metro Baltimore Chapter's formation, which was chartered during her term. Ms. Carter was responsible for the publication of one of the STC anthology series, Word Processing and Automated Publications Systems. Ms. Carter worked for the General Services Administration as a management analyst in the Office of Information Resources Management. She was a part-time instructor at the Graduate School of the U.S. Department of Agriculture. She continued to be active in STC until her death. Shirley G. Carter died on July 16, 1986. At the end of Shirley's term of office as a member of the STC Board of Directors, incoming Director, Austin T. Brown, presented her with the traditional Paul Revere bowl and a special plaque in recognition for being the first African-American female elected to the STC Board of Directors. Shirley Carter was also a member of the Association of Information Systems Professionals, the Federal Word Processing Council, the National Association for Government Communicators, and the USDA Graduate School, Subcommittee Writing and Editing. The memorial fund began in 1991 with a seed grant from the Society of $2000. The award was a living memorial to Shirley G. Carter and made it possible for us to expand our award offerings to the college and post-graduate levels while we continue our long-standing Austin T. Brown Technical Communication Award at the high school level. The education committee was managed by Paula Hollingsworth, a past president of the chapter, who applied for the STC grant for the seed money. The high school award program was managed for several years by Betty Montgomery, STC Associate Fellow. The awards are intended to honor individuals who make contributions to the technical communication profession in Maryland, DC, or Virginia. See the list of previous memorial award winners. Unfortunately, there are no records of previous memorial award winners before 2002. If you are a full-time student in an accredited college or university, we encourage you to submit your best work to the Technical Communication Competition. In the competition, the student who submits the best student entry will receive a Best Student Entry award. In the past, this was awarded to the top undergraduate and graduate student applicants. The college-level awards were inactive for some time because the self-perpetuating aspect of this fund did not materialize for various reasons. We began a fund-raising campaign in 2001 to rejuvenate the Shirley G. Carter Memorial Award and increase funds for the Austin T. Brown Technical Communication Award. Grant requests from the Society were approved to replenish the funds and we began the new award program for the 2002-2003 school year. We have been unable to find volunteers to staff the Education Committee but starting in 2009, the chapter will give awards for the best entry from a college-level student in our Technical Communication Competition. To donate by check, make your check payable to STC Washington, DC – Baltimore Chapter. Please write on the check that the payment is a "Shirley G. Carter Memorial Award donation" and mail your check to the chapter treasurer. For more information about making charitable donations see Corporate Sponsorship.